It is believed the population paying attention to the next generation display technology Micro LED has grown larger after Samsung demonstrated the 146" Micro LED modular TV at CES 2018. The large-scale display, named The Wall, is the first Samsung display made with Micro LED technology and features considerably high resolution and color contrast. It is comprised of numerous 9.37-inch display modules and thus, according to its maker, can be tailored into different sizes, whether the desired size is to go up to be larger or down to a much smaller one. 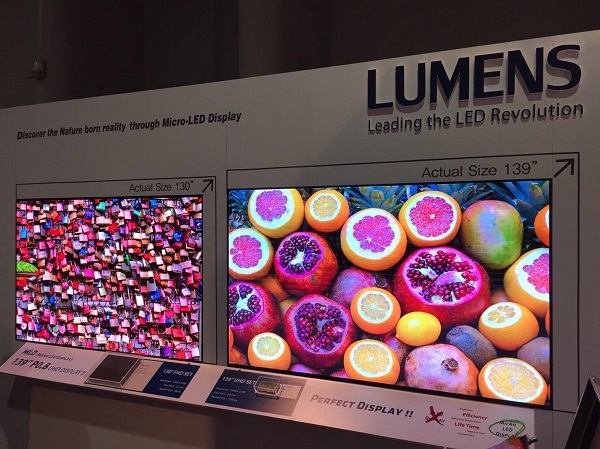 Indeed, the emergence of Micro LED does steal some of the limelight from OLED that has been dominating the television market for the past few years, but can Micro LED really challenge OLED? Self-emission is what these two display technologies have in common. Traditional LCD displays require LED backlight modules to emit light through layers from behind to generate images. Each pixel in an OLED display can emit light of a certain color independently and be switched on and off individually. That explains why OLED displays can have distinguished black level and color contrast. Samsung’s Micro LED display shares the same properties, so it can surely achieve effects such as very high contrast, extremely deep blacks, and fast response time. However, Micro LED has higher brightness and is more stable than OLED because of its inorganic nature. In other words, red, green, and blue Micro LED pixels do not have luminance decay issues. Compared with that, each OLED pixel more or less suffers from luminance decay and the speed of decay varies. To some extent, that makes Micro LED sound better than OLED, but, the reality is, OLED will not be that easily replaced. Almost all the big names we can think of in the tech industry see Micro LED as the next big thing. Samsung launched a massive modular display, while Apple acquired Micro LED developer LuxVue and even filed a patent covering a foldable iPhone sporting a Micro LED screen. People started to expect an Apple Watch and/or iPhone that features Micro LED technology. Even if the high brightness, wide color gamut, and modular design of Micro LED displays attracts a lot of attention, this technology is still at the R&D phase. Its production is far more expensive and difficult than that of OLED. It is definitely challenging to produce and place several millions of Micro LED chips, let alone to make them work smoothly. Sony started its Micro LED development early but has currently stopped the R&D related to Micro LED TV. It produced in 2012 the first generation Micro LED display using 6.22 million LED chips. Back then, the prototype was very power-hungry and the yield of its production was unsatisfactory. Despite the fact that a lot of problems have been resolved, it is still unlikely to mass produce Micro LED products at this point. It is also not easy at all to downsize Micro LED displays from over 100 inches to somewhere between the size range of mainstream televisions. The Wall from Samsung was in every way astonishing; however, it was intended to be manufactured as a large cinema screen, which means it is unknown whether it can truly be downsized. Samsung claimed its Micro LED display can be customized into different sizes and shapes to adapt to consumers’ needs, whereas currently the company has still not been able to maintain the pixel density to achieve 4K resolution while downsizing the screen. Even if it can produce mid-sized Micro LED TVs for households, the pricing will be difficult because it depends heavily on the production cost, which is still very high. LG Display, while Samsung stole the limelight with its gigantic modular TV, also launched its new display technology—a 65-inch rollable 4K OLED TV. The size is no longer the point here, but the flexibility is. The 4K OLED TV can be rolled up as a giant poster and hidden, stored in the container when it is not in use, just like a projection screen. As OLED is made of organic light-emitting materials, not semiconductors, it can be used for a broad range of display types. For example, transparent OLED (TOLED) displays have been retailed. Phosphorescent OLED (PHOLED) displays, compared with OLEDs, even have higher level of energy efficiency that can be for use in large displays, TVs, as well as general lighting. In addition, OLED can also be printed on plastics, which renders highly flexible but low cost displays. Most of all, whether it’s OLED, TOLED, PHOLED, or POLED, the difficulty of manufacturing is so much lower than that of Micro LED. They have been widely traded in the commercial display market. It also will not wait too long for OLED TVs to prevail. A few years ago, OLED TVs were alien to most of the customers, while the circumstance improved with the prices being hugely reduced. In the next one to two years, a 55-inch 4K OLED TV will probably be priced at below USD 1,000. The cost-performance index will surely go up, which is good news to customers. However, we are not saying OLED is facing a definite bright future. Before all types of OLEDs become prevalent, some technologies need to refine. Apart from the battery problems micro OLED displays encounter, how to miniaturize OLED components is also an issue engineers have to figure out. OLED will not stop growing, either. Not just the 65-inch rollable OLED TV, LG also released the next generation of the Wallpaper OLED TV. Just like its predecessor, the Gen 2 Wallpaper OLED TV sticks to the wall with a magnetic force. In the past, flexible OLED only existed in the fantasies, but now we know we could have more to expect about it in the coming years after CES 2018. By contrast, Micro LED is new but far less mature than OLED, and it costs a lot more, too. Even if it has plenty of advantages, it is too soon to jump to the conclusion that Micro LED will supersede OLED.